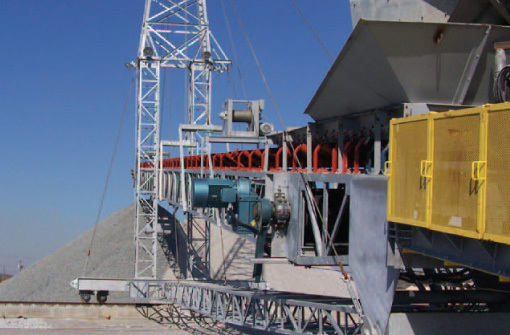 Radial Stacker Winches - Bulk Material Handling | Thern, Inc. Even the biggest jobs are manageable with the right winch. 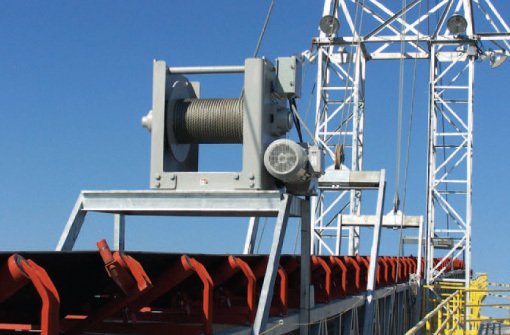 A custom-built power winch can conveniently and efficiently adjust stacker payout angles and provide reliable, long-lasting service, eliminating downtime and reducing costs. The advantage of the radial stacker is that it gives the operator the option to create many multiple stacks of material or one continuous radial stack. This can be useful for sorting materials, but it also gains the operator more stacking capacity as opposed to one large pile of material directly in front of the conveyor. The stacker is a 200-foot long conveyor that pivots at one end with the other end able to be raised and lowered. Positioned on a mounting plate sitting above the conveyor belt near the pivoting end of the stacker is a Thern 4WS26M26 electric winch, which serves as the means to raise and lower the grade of the stacker at the opposite end.